Eric Berlow: An Ecologist, internationally recognized for his research on ecological complexity and for creative approaches to simplifying complex problems. Sean Gourley: Physicist with an interest in politics, now using data to understand the nature of human conflict. Eric and Sean met when they discovered each had spoken at separate but related TEDx talks on the Ecology of war, and began questioning if other TEDx talks were unknowingly linked as well. They analysed the mathematical structures behind all 24,000 TED talks, by pulling the comments, viewers, and extracted transcript of the talks from Youtube. They then extracted key concepts from each talk, to find the ‘meme-ome’ or underlying idea of a talk. By comparing Meme-omes between talks, they can map links. 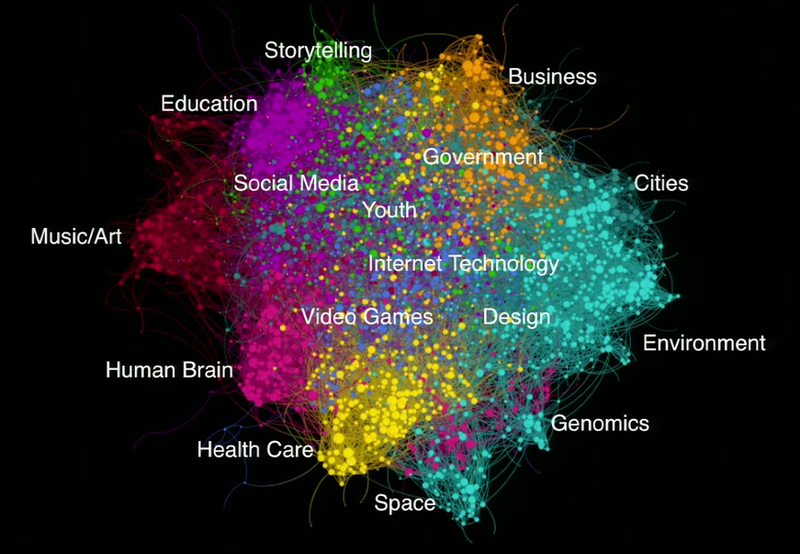 Related subjects are grouped nearby, meaning stronger links between talks of those subjects. By zooming in on ‘Environment’, they saw all the sub-conversations eg food economy, solar, greenhouse gases. They can also see which conversations are the most important to males vs females, or young vs old. Some thaat are completely ‘out there’ – not fitting clearly into any particular field. These algorithms allowed Eric and Sean to simplify their understanding of an extremely complicated network of TED knowledge into a single network map – making the information a little more accessible and a little more ‘human’.